Neither Blake Heriot nor Brady Gehret had raced 300 meters before. Yet, in two different sections of the junior boys 300 they notched the two fastest times in the country this season. Ryan McDermott had one of those moments. It was the kind of moment that instigates multiple cell phone calls and tell the same story over and over and over yet each time with a renewed excitement. He already had the story laid out for him. All the Duke senior needed to do was secure the happy ending. Ryan McDermott had one of those moments. It was the kind of moment that instigates multiple cell phone calls and tell the same story over and over and over yet each time with a renewed excitement. He already had the story laid out for him. All the Duke senior needed to do was secure the happy ending. LSU’s Walter Henning can call the Armory home. He knows everyone in the building. Even more people know him. Plus he spent endless hours camping out by the throwers’ cage for countless weekends as high schooler at St. Anthony’s on Long Island. When Melissa Kurzdorfer let the weight go, she let out the sort of primal yell that accompanies throwing events as a matter of custom. But the scream turned from a release of tension to a signal of terror while Lancaster’s star thrower started to tip out the throwing circle. Texas A&M, NCAA national champions last spring for men and women, returns to the Armory for the 2010 New Balance Collegiate Invitational Feb. 5-6. The Aggies, coached by Pat Henry, were women’s team champions at last year’s NB meet as well. Baylor won the men’s. The U-M quartet of Rebecca Addison, Jillian Smith, Danielle Tauro and Shana Vinson placed seventh in the distance medley relay on day one of the New Balance Collegiate Invitational. Midlothian senior Kathleen Lautzenheiser made her presence known in junior girls 1000 meter race at the New Balance Collegiate Games on Friday in New York City making a strong move for the lead and ended up with a VA #6 all-time performance in her fourth place showing. The Midlothian girls competed on Saturday in the high school 4x800 meter relay at the New Balance Collegiate Games in New York City. After the Lake Braddock girls established themselves as the front runners in the relay event several weeks ago when they went north and posted a swift time of 9:19.90 at the New York Armory, the Midlothian girls decided to take a crack at a fast time on the banked 200 meter track as well. With splits of 2:27 (Claire Benjamin,), 2:18 (Marie Johnston), 2:18 (Amy Witt), and 2:15 (Kathleen Lautzenheiser), the Lady Trojans were able to post a time just under their rivals from Braddock ran two weeks ago with a fourth place effort of 9:19.71. The state meet is shaping up to be a great showdown between two schools who have a long history this past decade of challenging each other for state titles in cross country and the 4x800 meter relay. 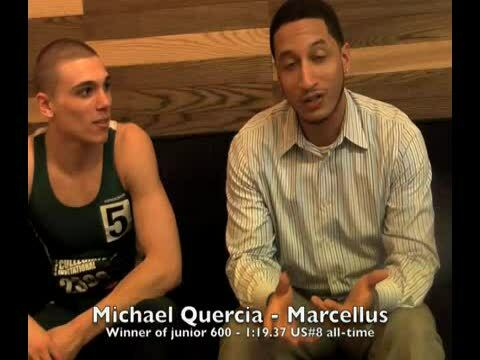 Marcellus senior Michael Quercia talks to Christopher Hunt after winning the junior boys 600 in 1:19.37, US #8 all-time. The boys 1000 meter race at the Group AAA State Meet this year could be a great race even without including defending state champion Anthony Kostelac of Albemarle. There are three runners right in Group AAA who currently have times at 2:30 or faster including Lee-Davis junior Cody Snyder, who followed up his early season US #1 time at CNU last month with a VA #12 all-time performance of 2:29.44 at the New York Armory this past weekend. Coaches are reminded that entries will close at Noon EST Tuesday, January 26. MAKE SURE YOU FINISH BEFORE THAT TIME. Oklahoma Track and Field athletes earned 10 NCAA provisional qualifying marks in the first of two days of action, Friday, at the New Balance Collegiate Invitational in New York City. The meet, held inside the New Balance Track and Field center, features 16 nationally ranked teams including Oklahoma's No. 9 men and No. 15 women. While Anthony Kostelac was a no show for Friday's anticipated 1000 meter showdown with some of top middle distance preps on the East Coast at the New Balance Collegiate Games (potentially due to the snowstorm which has hit the Mid Atlantic this weekend), three other Virginians participated and posted fine times in the race. The University of Cincinnati indoor track and field team competes in its final tune up prior to the BIG EAST Indoor Track and Field Championships when it travels to New York City for the New Balance Invitational Feb. 5-6 at the Armory Track. The Bearcats will get a feel for the venue as it will return to the Armory track Feb. 20-21 when it returns for the BIG EAST Indoor Championships. Neely Spence (Shippensburg) won the 5000m Championship in 16:13.01. Carl Mackenzie highlighted the final day of competition at the New Balance Collegiate Invitational hosted by The Armory on Saturday. On Friday, events begin at 10 a.m. CST. On Saturday, events begin at 8:15 a.m. CST. Live Webcast of New Balance InviteLive Scoring for VT ElitePodcast with Michelle NewmanThe University of North Carolina track and field team got off to a fast start Friday at the New Balance Invitational at the Armory Track & Field center. A total of 11 sprinters and hurdlers were in competition Friday, as the track and field team split up this weekend as fellow teammates traveled to Blacksburg, Va. to compete in the Virginia Tech Invite. After much success at The Armory, the women's track and field squad will return for the New Balance Collegiate Invitational on Friday and Saturday and look to add more conference qualifiers in the final weekend before the BIG EAST Championships. Freshman Hayden Baillio led a 1-2 finish in the shot put as Texas opened competition at the New Balance Collegiate Invitational in New York City on Friday. Baillio won his fourth straight shot put event, while sophomore Jacob Thormaehlen set a big personal best to finish second. The women's distance medley relay ran an NCAA automatic qualifying time to highlight day one of the New Balance Collegiate Invitational hosted by The Armory in New York. Junior Jarret Eaton automatically qualified for the NCAA Indoor Championship as he took home the title in the 60m hurdles at the New Balance Invitational in New York on Friday evening. Eaton finished in 7.68, just .02 seconds from the qualifying time of 7.70. The Texas Tech track program had its best weekend of the season as the Red Raider and Lady Raiders saw an automatic mark by Bryce Lamb, two school records and eight NCAA Provisional marks at the New Balance Collegiate Invitational, New Mexico Classic and the Texas Tech Open. Kevin Schwab led the Oklahoma Track and Field program Saturday at the New Balance Collegiate Invitational as the redshirt-freshman won the men's 3,000-meter championship run. Schwab won the event with a time of 8:05.02, just off the NCAA provisional qualifying standard of 8:05.00. While Schwab fell just short of an NCAA mark, Scott Cooper (800-meter run), Jasmine Simmons (triple jump) and Mookie Salaam (200-meter dash) along with the men's 4x400-meter relay each eclipsed the standard needed to be considered for the NCAA Championships. Five Hoyas ran BIG EAST and ECAC marks as they dominated the field in the women's mile today at the New Balance Invitational held at The Armory in New York City. Three-time All-American Emily Infeld ran an NCAA automatic qualifying time in the event (4:36.83) and finished second overall. The women's 800-meter run was simply one in a day full of highlights at both the New Balance Invitational and the Giegengack Invitational in New Haven, Conn.
Five victories and six runner-up performances highlighted the first day of the New Balance Collegiate Invitational held at the Armory in New York City. Five more victories and a pair of school records on Saturday led to a pair of team titles for No. 1 Texas A&M at the New Balance Collegiate Invitational held at the Armory in New York City. For the first time this season, the University of Houston track and field team will split up to compete in two separate meets. Invited Cougars will travel to New York, for the New Balance Invitational on Feb. 5-6, while the remainder of the team will stay in Houston for the UH All-Comers Meet on Feb. 6 at the Yeoman Fieldhouse. BATON ROUGE - A championship atmosphere awaits the LSU track and field teams this weekend as they make their annual trip to the New Balance Track & Field Center in New York to compete in the New Balance Collegiate Invitational on Friday and Saturday. The Xavier men's and women's track and field team is headed to the Big Apple to take part in the nationally recognized New Balance Collegiate Invitational held at the Armory Track & Field Center on February 5-6. XU will be competing with over 100 universities and colleges including reigning NCAA national champions No. 1 Texas A&M. The women's distance medley relay squad nearly ran a school-record performance on the first day at the New Balance Invitational, hosted by The Armory in New York City. The quartet ran a time of 11:03.80, the second-best time in school history behind the 2009 NCAA performance of 11:02.67. The women's DMR was the highlight of a number of impressive performances today. St. John's completed the second day of the New Balance Invitational with several student-athletes placing in the top 10 in the championship events. The annual two-day meet, held at the New York Armory Track & Field Center, attracts some of the nation's top talent from North Carolina to Texas. Senior Nicole Schappert highlighted the last day of competition at the New Balance Collegiate Invitational on Saturday afternoon as she ran an NCAA automatic qualifying time en route to winning the mile at The Armory.